You are at: Home Crunchy By Geography? Crunchy. What does it mean? Well, that may all depend on where in the United States you happen to live. Recently, I was at a work dinner. Suits and ties; heels and handbags; cocktails and the works; a typical corporate night out. It was a team event that included the 15 coworkers I work with most closely. Standing with drink in hand, five or six of us we were discussing life in Colorado as compared to Northern Virginia. My company’s corporate headquarters are in Northern Virginia, just outside Washington, DC, and one of my co-workers had flown in from Aurora, CO. She was explaining the outdoorsy lifestyle prevalent in her neck of the woods and someone dropped the word crunchy. I chimed in and said, “Crunchy?! ?” trying to follow the jump from being outdoorsy to an equivalent of being crunchy. Almost immediately two coworkers replied, “Briana, you are most definitely crunchy.” Their replies were so synchronized that I’m surprised one of them didn’t yell ‘jinx!’ As crunchy as I might actually be, I don’t like getting dirty, let alone camping, and I often joke that ‘roughing it’ for me is a night at the Motel 6 – so not really an outdoorsy kind of gal. In general, I’m not a fan of labels. I feel as though labels come with stereotypes. Both stereotypes and labels are laced with underlying judgment. Judgment of others is just. Not. Cool. I don’t want to be judged; you don’t want to be judged; nobody wants to be judged. And labels facilitate judgment. In any case, the speed in which my coworkers jumped to label me in that moment truly startled me. Then, it really got me thinking. Google.com defines crunchy as “politically and environmentally liberal.” Dictionary.com defines crunchy-granola as “characterized by or defining oneself by ecological awareness, liberal political views, and support or use of natural products and health foods.” My personal definition is a work-in-progress, but the roots developed initially from a parenting style: baby wearing, extended breastfeeding, baby-led weaning, attachment-style parenting, and natural (medication and intervention-free) childbirth. We recycle and try not to waste. We also happen to source most of our food from local sources: meat and eggs from a local farmer with responsible farming practices that we believe in, and vegetables from community-supported agriculture (CSA) – all technically organic, although not USDA certified. We generally don’t eat processed foods of any kind, are hugely anti-GMO (genetically modified organism), and buy organic items for those things that we don’t get from the farm or CSA. We focus on consuming a variety of whole foods and take care in our food preparation to maintain as much nutritional value as possible. These are just some of the ways I’m probably viewed as crunchy by many people. The day after the dinner, I was talking to my best friend(and San Francisco resident) about the outdoorsy-to-crunchy-label discussion from my work dinner the night before. She agreed with my general line of thinking that geography plays a part. In California, the term crunchy has a much earthier, Birkenstock-wearing hippie, commune-living connotation since many Californians are inherently energy-conscious, organic food-eating, reduce-reuse-recycle practicing, resource-conserving citizens. In the DC Metro area, simply advocating for natural childbirth can earn the crunchy label. 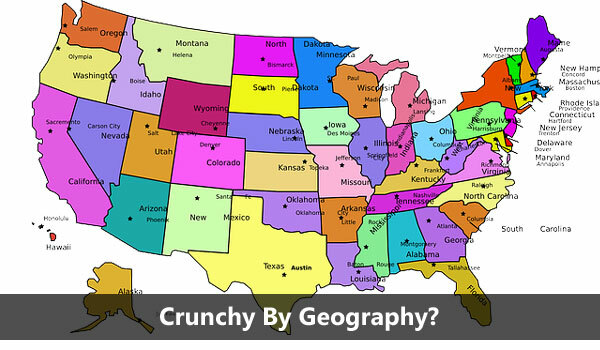 So now I’m left wondering – how is the term crunchy defined differently by geographical location, if at all? Where in the country are other pockets of densely populated crunchy citizens? Seattle? Portland, Oregon? How about Vermont or New Hampshire? What’s crunchy like where you live? While juggling a full-time job outside the home, Briana is a mom to two young sons, ages 5 and 3, and a daughter born June 2014. An advocate for whole-foods cooking, avoiding GMOs, natural childbirth, breastfeeding/extended breastfeeding, baby-wearing, and attachment-parenting you can also find more posts on her personal blog site, www.theSoWhatMom.com or follow day-to-day antics on Instagram @thesowhatmom.